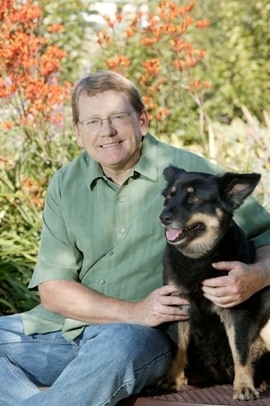 Ken Volk is a winemaker, consummate in his knowledge of horticulture, terroir, soils and grape varietals. He knows who farms the best vineyards and, more importantly, how to access the fruit that he can effectively mold into his fine signature wines. After spending a few hours with him, I realized that he has likely forgotten more about wine than I have ever understood. He is also a genuinely nice-guy who gives freely of his precious time to share the passion that has made him one of the most influential winemakers in the country. 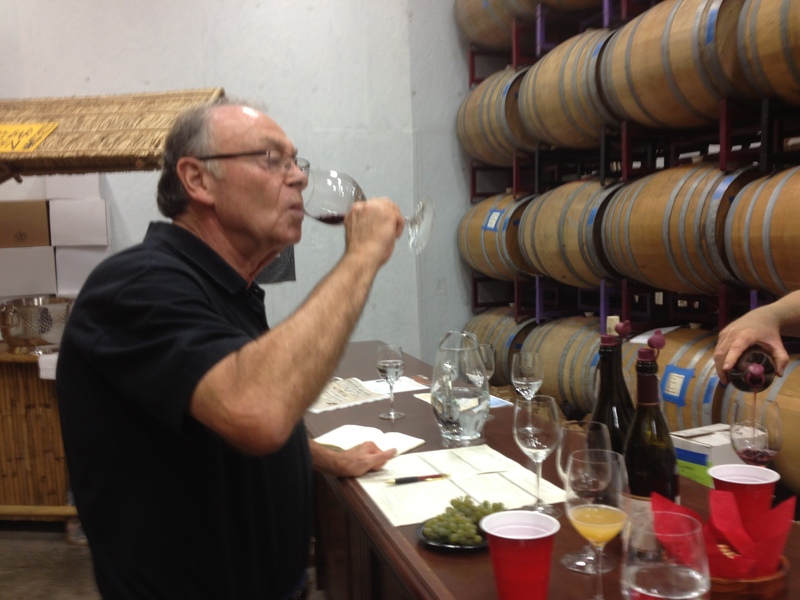 A love of horticulture, specifically citrus and avocado, led him to a degree from Cal Poly San Luis Obispo and stints at a few wineries before starting Wild Horse Winery, which he built into a successful large-production operation. 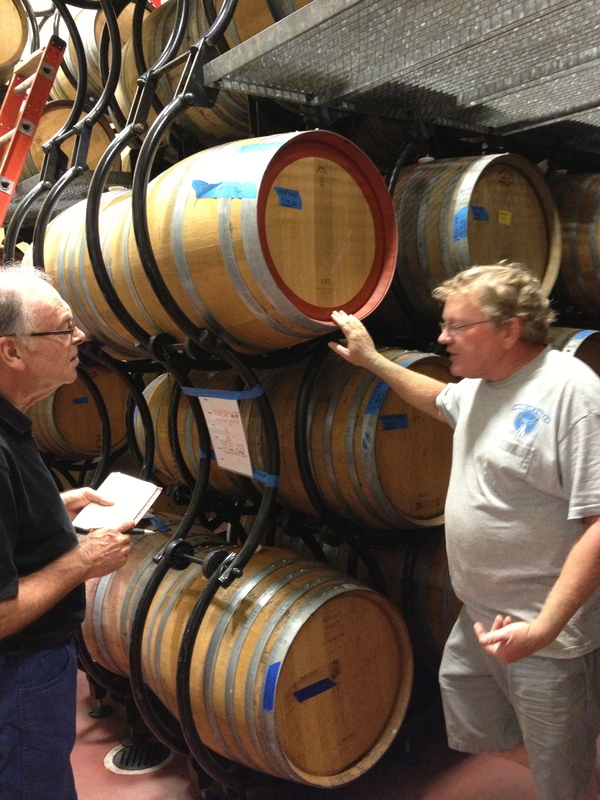 His success drove him more to the business side and away from his ultimate desire to make wine. He sold Wild Horse, assembled some land and in 2005, purchased the old Byron Winery site in Santa Maria and launched Kenneth Volk Wines, a smaller production boutique winery that allows him to be hands-on at every level. It is harvest time in north Santa Barbara County. With drought conditions and some of the hottest average temperatures on record, the grapes are ready. These are critical times for winemakers who must convert newly picked stock into juice immediately to avoid impacts of the heat. Once the grapes are ready, the window is very small. On this morning, trucks are delivering about five tons of tempranillo grapes in large tubs, removed by forklifts, weighed and inspected before the initial process began. Larger in size than most wine grapes, the dark clusters have been infiltrated by small green berries. Ken describes them as seedless grape buds than did not form the necessary enzymes to mature and expresses concern they could impact the quality of the juice. He decided to reduce the speed of the de-stemmer/crusher, directing most of the little green invaders with the stems and leaves. Some of the nice grapes must be sacrificed, at significant expense, but the only decisive factor is to support and enhance the superiority of the harvest. debris. The good juice is immediately pumped to stainless steel holding tanks for the first pre-barrel fermentation process. Surprisingly, dry ice is introduced to cool the holding tanks, helping to get the field heat out of the fruit while protecting against oxidation. While in the tanks, yeast is introduced and the juice is pressed down, separating from the skins. Even the barrel room at Kenneth Volk Vineyards is unique. The racking system for the 1,000-barrel places each barrel on rollers to provide more “lees” (dead yeast cells and pulp) exposure for white wines. Once again, the extra expense and effort are intended to augment the bouquet and flavor of the juice. Once in the tasting room, Ken becomes a “kid in a candy store,” willing to share any of his treasured releases, both diverse and abundant. Before the wine, we tasted some albarino grapes, fresh from the vineyard. The floral aromas, sweetness of the grapes was over the top, far beyond any white table grape. Next, we sampled some sweet, partially fermented albarino juice that was already expressing strong hints of melon and stone fruits. 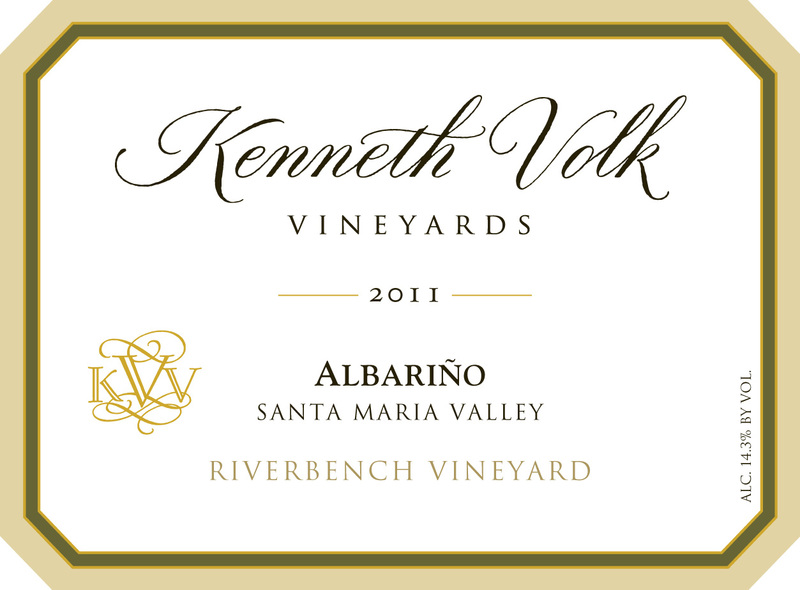 The final part of this tasting trifecta was the 2012 Kenneth Volk Albarino Riverbench Vineyard ($24), a crisp, refreshing wine with a nice flavor burst on the backend. A nice surprise of this tasting was the 2010 Kenneth Volk Verdelho Pomar Junction Vineyard ($24). Grown in several regions throughout Portugal including the island of Madeira, verdelho plantings are expanding in many California appellations. These grapes came from Templeton, south of Paso Robles to help create a brisk wine with a substantial burst of flavor and creamy texture on the finish. A bit taken back when he suggested the 2012 Kenneth Volk Malvasia Bianca San Bernabe Vineyard ($24), Ken explained that his is not sweet, but dry, floral, aromatic and slightly astringent. The vineyard, located along Highway 101, near King City is one of the warmest in the region for full ripening. 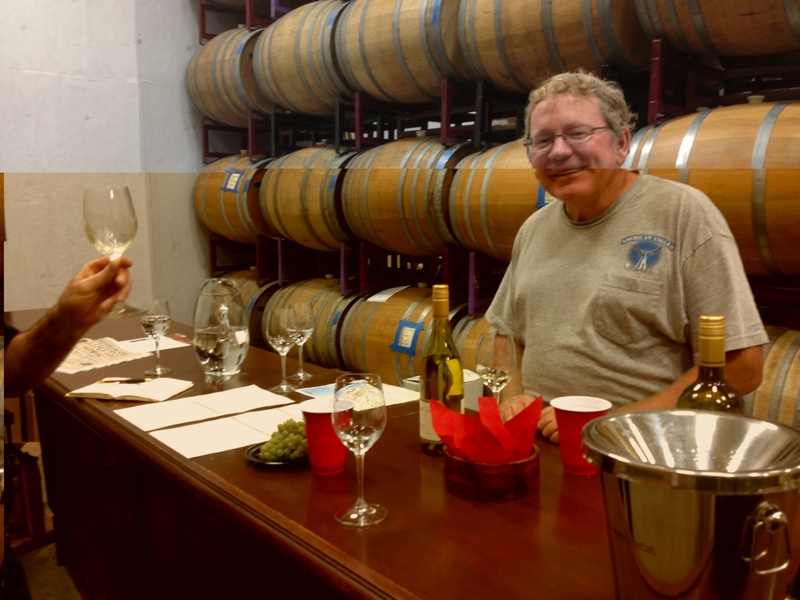 Next, we tasted the distinctively different 2011 Kenneth Volk Chardonnay “Jaybird” Santa Maria Valley ($22), crispy, totally sans oak and the oak-laden 2010 Kenneth Volk Chardonnay Bien Nacido Vineyard ($28), benefitting from malolactic fermentation and time in the barrel. While poles apart, both wines share full flavor profiles and have been highly rated by Wine Enthusiast magazine. The Bien Nacido Vineyard sources many high quality, well-farmed varietals to several winemakers throughout the region and here; we enjoy the rich texture, stone fruit and butterscotch nuances of a California chardonnay. Maria Valley and another from an appellation in San Benito County that peaked my interest called Lime Kiln Valley. The inland Lime Kiln Valley appellation, located south of the towns of Hollister and Tres Pinos, is known for soil composed of large amounts of limestone and dolomite. All the Lime Kiln Valley vineyards are owned and operated by the Enz Family, who now grow many varietals exclusively for Kenneth Volk Wines. Minerality in the aromas and flavors of the 2009 Kenneth Volk Pinot Noir Enz Vineyard Lime Kiln Valley ($48) are evocative of the fine, earthy red wines originating from the Burgundy region of France and, hence, my favorite. With high expectations from this infamous vineyard, the 2009 Kenneth Volk Pinot Noir Bien Nacido Vineyard ($60), at a higher price, delivers that lush, velvety texture with flavors of strawberry and cherry following an earthy bouquet. The value-priced 2009 Kenneth Volk Pinot Noir Santa Maria Cuvee ($30), awarded 90-points from Wine Enthusiast magazine, conveys another earthy bouquet followed by concentrated fruit on the palate. Our tasting, far from complete, ended with five inimitable red varietals, many of which were new and fresh to my senses. One of the common varietals used in ports and still wines from Portugal, the 2010 Kenneth Volk Touriga Nacional Pomar Junction Vineyard ($36) had robust floral aromas and complex flavors ending with a nice “slate” finish. 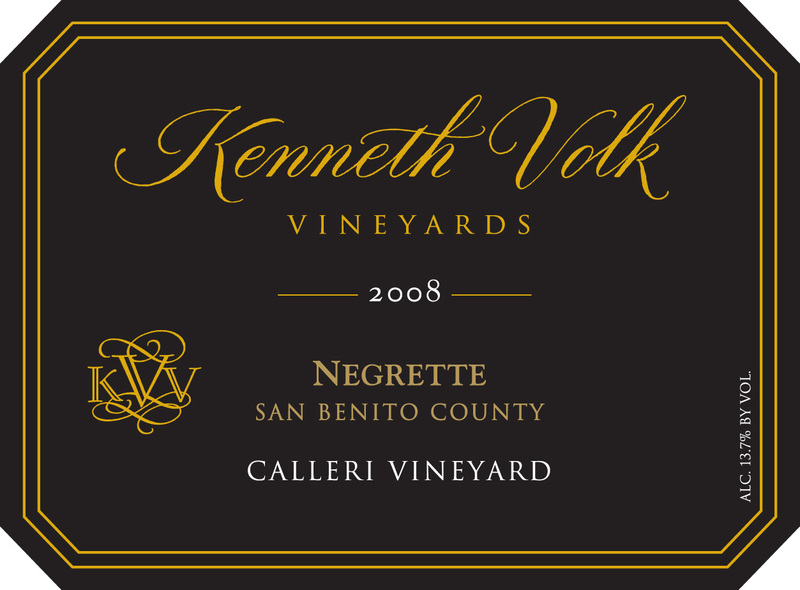 The Lime Kiln Valley AVA is, once again, showcased with the rare 2008 Kenneth Volk Cabernet Pfeffer San Benito County ($28), a varietal often confused with “Gros Verdot” from the Bordeaux region of France. 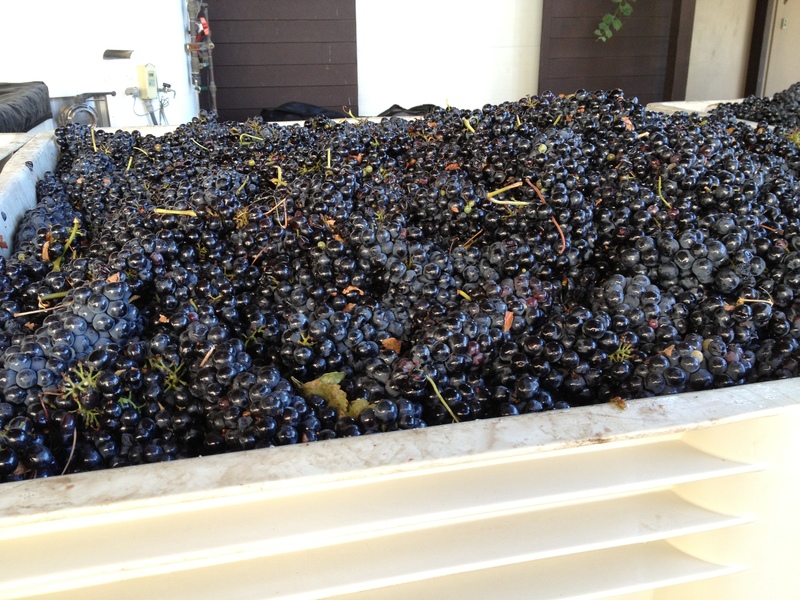 Many believe that these grapes are Gros Verdot, but our government only recognizes Cabernet Pfeffer. Whatever the proper name, this drinkable wine adds a soft spice element to the bouquet and flavor. varietal originating in the Toulouse region of France, is dark red in color with softer tannins similar to Pinot Noir. From the Basque region in southern France rather than the Rhone Valley, some winemakers in the Paso Robles region have begun to plant the rare Tannat grape. Paso’s Bella Collima Vineyard sourced grapes for the 2010 Kenneth Volk Tannat Bella Collima Vineyard, a rich, full-bodied wine with robust flavors that pair well with meats and game. I have long enjoyed mourvedre as an important component, adding richness to the classic “Rhone Blends” in both France and California. A few of our winemakers, throughout variable regions, have experimented with 100% mourvedre releases. Once again seeing the potential of the warmer Lime Kiln Valley vineyard, the 2009 Kenneth Volk Mourvedre Enz Vineyard ($36) seems to provide enough season for the grapes to properly ripen, resulting in resonant aromas and concentrated flavors that will age well. 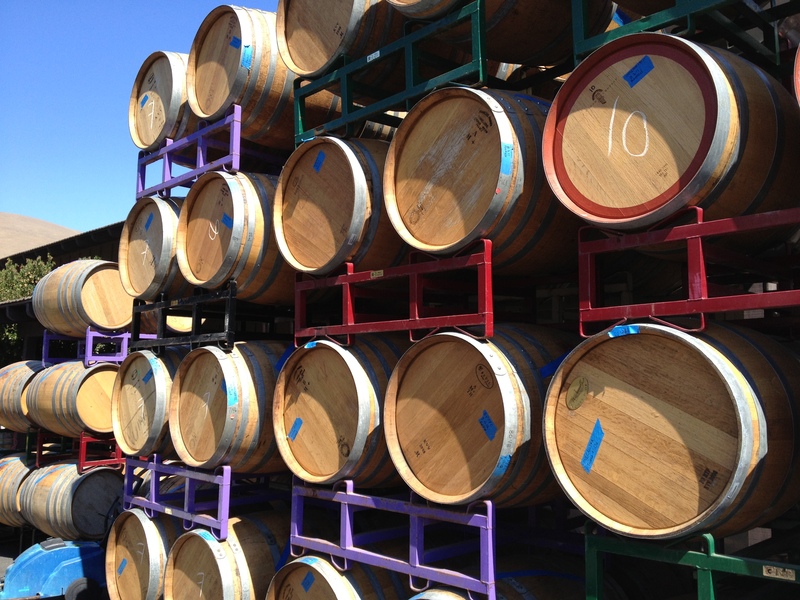 As we were leaving the winery, Ken asked why I hadn’t commented on the multi-colored barrel storage racks. He explained that each year, some racks are painted in the color of the NBA Champions. There are red for the Miami Heat, black for the San Antonio Spurs, green for the Celtics and, yes, purple and gold racks that are beginning to rust and in need of a new coat. Extraordinary wines, stimulating conversation and a behind-the-scenes look at the Kenneth Volk Vineyard operation made for a wonderful afternoon in the Santa Maria Valley. It also gives me confidence that wines produced under Ken’s name will exceed expectations. This entry was posted on Thursday, September 26th, 2013 at 9:14 pm	and posted in Wine. You can follow any responses to this entry through the RSS 2.0 feed.